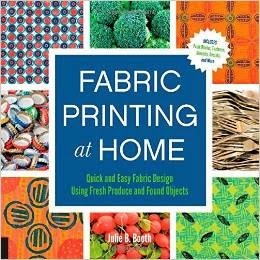 About two months ago I wrote a review about the book Fabric Printing at Home written by my friend, Julie B. Booth. Today I'm going to show you one of the things I learned from her book and then give you an opportunity to win a copy of the book for yourself. I used a hot glue gun to create a design onto a toilet paper roll. I was impatient and didn't seal the toilet paper roll with white glue or a gel medium before creating my design. I inserted a short roller handle that one can find at the local hardware store into the toilet paper roll. 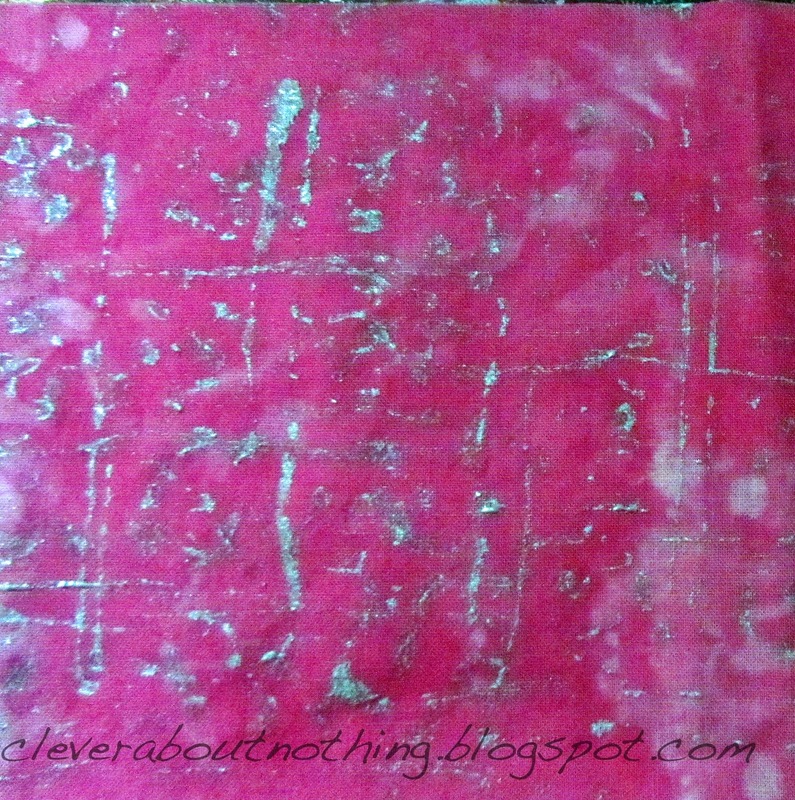 . .
. . .and used my 3x5" Gelli Plate as a paint palette. I rolled the paint across a sample piece of fabric. . .
. . .first going long ways. . .
. . .and then again short ways. I really like the texture this provides whether I go once or twice across the fabric and I'm gladly adding it to my art "toolbox." Have you tried something like this before? What have you used it for? Leave a comment below (either answer one of my questions or just say Hi!) and you will be entered for a chance to a copy of Fabric Printing at Home. The winner will be chosen on February 14th! Be sure to stop at Julie's blog everyday for the next two weeks as she will be giving away daily prizes, and then visit each blog listed below on the designated date to enter for another chance to win Julie's book! How clever. Knew I was saving those nice quality rolls for something even if I didn't know what. ;>) I think I would love to have a copy of the book, and am glad I am getting a chance to explore all of the blogs on the tour. Cleaver using a to roll! How fun! I haven't, but it looks like it would be fun to figure out. Love the tp roll idea! Amazing how wonderful results can be! Thanks! 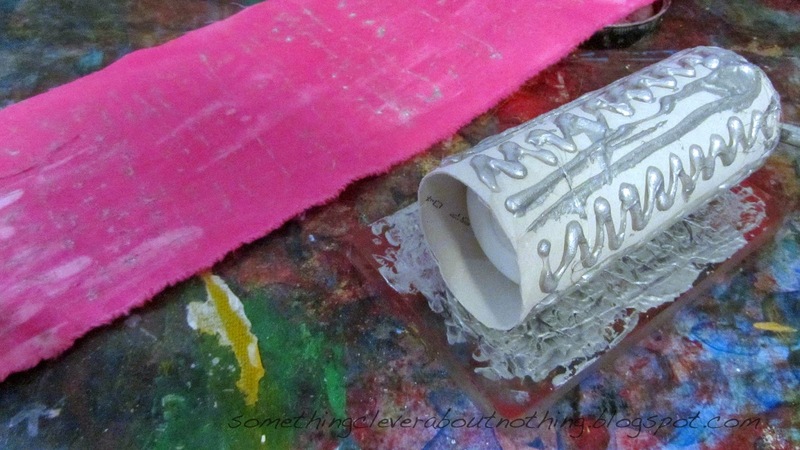 I have not used glue on a toilet paper roll before, but it did use rubberbands wound around my brayer. I love the marks I got using that. I will be trying the toilet paper roll and glue method. I never thought to use a glue gun with a toilet paper roll, but have used one on flat cardboardd. I have not done it with a roller. But have taken just old cardboard and put my design on it with glue/puff paint and then place in paint and then on the fabric for the desired design I wanted. Great idea, Lisa. Another use for toilet paper rolls. I've used hot glue on a tp roll before, but appreciated your tip on the roller. 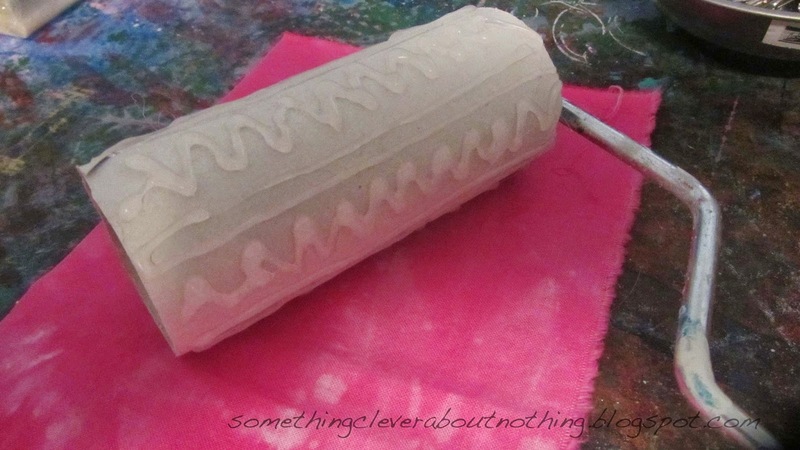 I've used wood blocks wrapped in twine or with foam shapes stuck on them to stamp, but never this rolling method! We would love to win this book to improve our fabric printing skills! Never thought about going in both directions! Thanks! Glad to see recycling of materials! Want to try this! What a great idea! I have plenty of glue and paper rolls. Thanks for the fun! Very creative and certainly inspiring.......and equipment I have on hand to boot. Look out, I am off to try this. Deb C.
That's so interesting! I have bought some fabric paints to try out but haven't had a chance to yet! 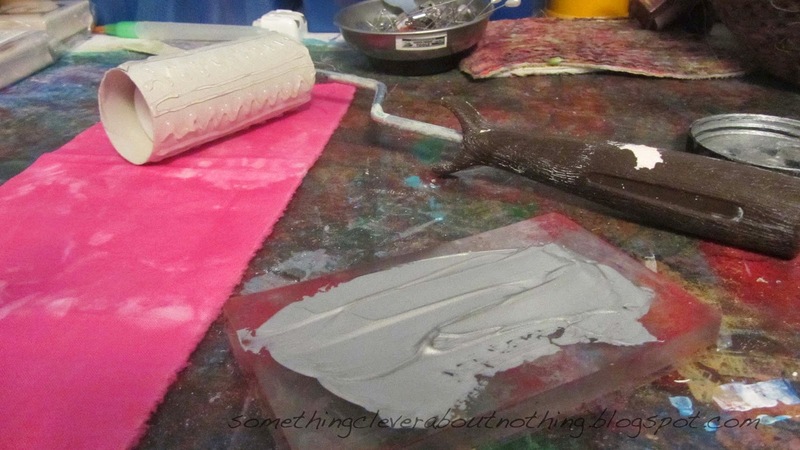 Love this idea for fabric printing. 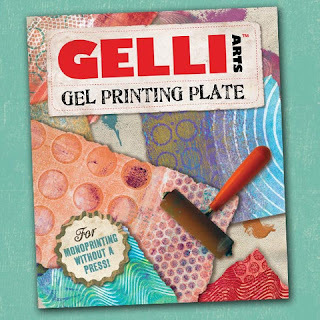 I will try for gelli printing too. Cool. Lynn... THIS is what I call creative use of ordinary objects, and we can always count on you to share! The texture is wonderful, and the contrast subtle but very interesting. Love it! Hi, printing was always expensive blocks and screens but Julie makes it so delightful and simple.Love what you created. What a great idea - I've never seen this before but I shall definitely be trying it! What a great idea, Lisa! I have one of those small rollers here at home and an abundance of toilet paper rolls. Thank you! Time to go test it out! I've used a rolling pin in a similar way! who knew the humble toilet paper roll could serve so many diversified uses! That is so cool! Must try it! Definitely looks like something I'd like to try! Looks like a great creative outlet - 2 dimensional art meets 3D sewing arts all rolled into one. Love it! I need to try this. Great idea! Really excited about so many new ideas to try! What a great idea for printing-love it! 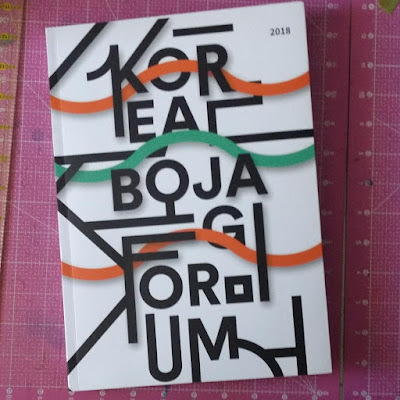 Thanks for the chance to win this book. I think I have almost everything I need to try this. Making a list for the rest. I love your fabric. I like the toilet paper roll idea. What a FUN book! I'd love to win! I knew IT! I knew I should've been saving those TP rolls. This is ingenious, another trash into treasure find. Love it. Thanks! A reason to save tp rolls! What a fun project...thanks! I love your idea, using what you have on hand and letting your creativity come out to play! I've been saving the rolls from empty saran wrap knowing that I'd need them one day. Thanks for the fabulous idea! What a fun way to get some great texture. Thanks for showing us. Hi, those tiolet paper rolls come in handy. Thanks! This is something I can do with my high school students in class. We are currently creating collographs. This is a collograph in the round! Thanks for sharing this. 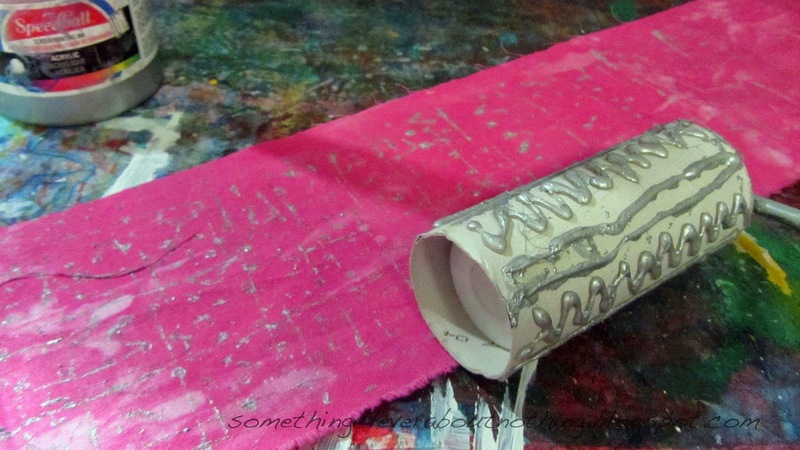 I would have never thought of using toilet paper rolls on a paint roller to print with! I haven't tried this but I have all the supplies to make a pattern roller. I will definitely try it, and this is a book I'd love to win. I've used an old potato masher I found at a thrift store for creating pattern on cloth. It created a wonderful grid pattern for background. I think I will give this a try! Looks like fun! Fun to see your printing experiment. I like its simplicity! Would love a copy of the book! I really like your site. I just tossed a bunch of mt tp rolls in the recycling bin! Darn! Oh well, there will always be more! Thanks for the great idea! The glue-gun/toilet paper roll idea is new to me. But I like it! 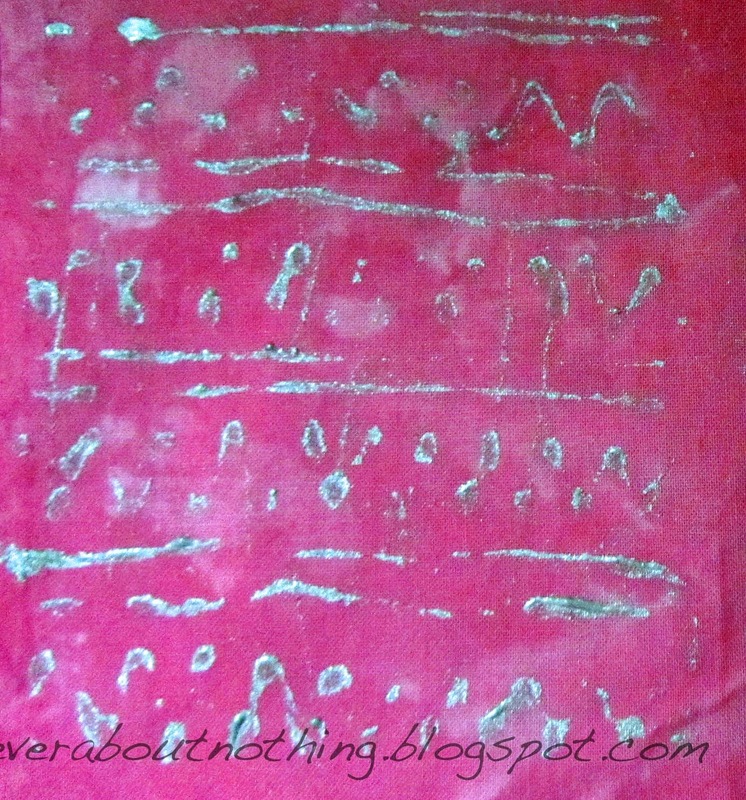 Gelli Prints I have tried. Good thought to use that as the background for your hot glue print. Thanks for the post and the chance to win. What a great post! I have used hot glue on cardboard before with the grandkids, that was fun! I really like your printing method, and the results are very cool! Every time I throw away a TP empty tube I think, I should be saving this, now I have reason, other than hording! What a clever idea. I might have to hold on to the toilet roll tubes from now on. I have a bin full of cardboard rolls just waiting, thanks for the reminder lol ...love your work! HaHa, who would have thought! Great fun!!! What a clever idea - this book looks so fun!